LANSING — If you’re a state lawmaker looking for a free meal, this week may be one of the premier weeks for you, according to the statistics. You’ll just have to head north. Around this time each year, the Detroit Regional Chamber of Commerce holds its annual gathering on Mackinac Island. The four-day Mackinac Policy Conference brings together business leaders, government officials (including legislators), lobbyists and reporters to talk strategies for improving the state. Over the years, the event has also coincided with a spike in lobbyist-sponsored receptions where food and drink are purchased for large numbers of government officials at the same time. Registered lobbyists in Michigan have to report spending on specific functions in which they purchase food for more than 25 state officials. 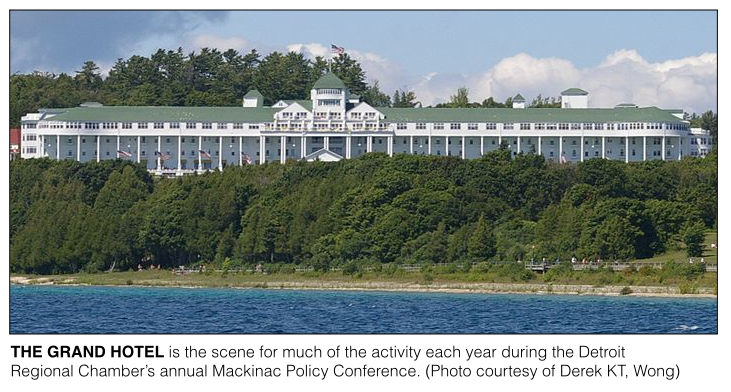 Over the last three years, the main days of the Mackinac Policy Conference have seen a spike in lobbyist-sponsored group functions. In two of the last three years, the Mackinac Conference coincided with the highest number of expenditures for group functions of any similar period. In one year, it tied for the most. June 1-2, 2016 — two days during the 2016 conference — saw a total of eight disclosed expenditures on, food, receptions or dinners for large groups of state officials. Only one other two-day period for the entire year of 2016 saw eight group expenditures. The June 1-2, 2016, events cost a total of $13,605. They included a “Mackinac Client Reception” by the lobbying firm Muchmore Harrington Smalley and Associates, a “social event” by the firm Kheder Davis and Associates and a dinner by DTE Energy, according to disclosures. May 27-29, 2015, coinciding with the 2015 conference, saw nine expenditures where lobbyists reported buying food and drinks for large groups of state officeholders. No other three-day period in 2015 saw more than eight such expenditures. The cost of the nine expenditures was $19,810, according to disclosures, including a $4,546 reception put on by the firm Midwest Strategy Group. May 28-29, 2014, which coincided with the 2014 conference, saw eight group expenditures where lobbyists reported buying meals for officeholders. More such events happened those two days than any other two-day period in 2014. The total cost of the eight 2014 expenditures was $15,850. 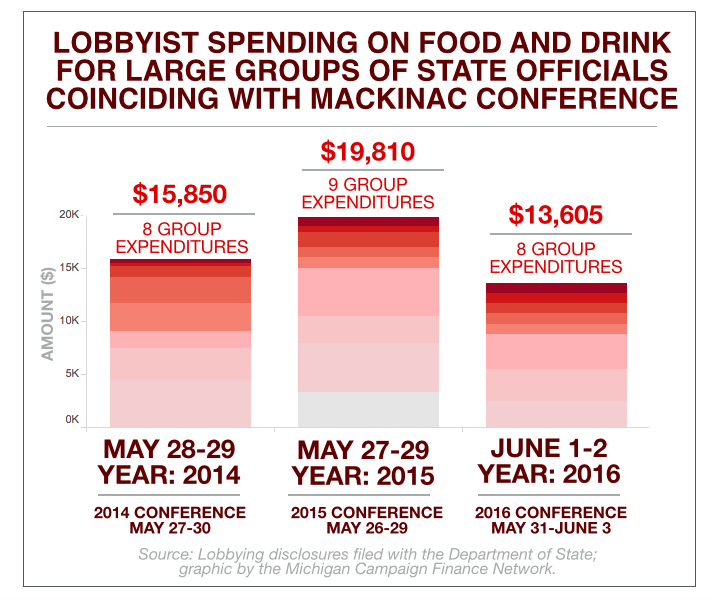 Because of Michigan’s lobbying disclosure laws, it’s impossible to tell how many meals individual lawmakers received during the days of the conference. The laws require lobbyists to disclose only total tallies of food purchases provided to individual lawmakers if more than $59 is purchased in a month or $375 in a year. There will likely be more lobbyist-sponsored dinners in 2017 with a wide variety of elected officials scheduled to attend this year’s conference, which starts on Tuesday. According to a listing available from the Detroit Regional Chamber, two U.S. senators, eight members of Congress and a majority of the state Legislature are scheduled to attend the event. If the past is any indication, some of the officials will likely use campaign cash they raised to help get them to the island. In 2016, three state lawmakers — Rep. Lee Chatfield, Sen. Curtis Hertel and Sen. Dale Zorn — reported spending campaign money on a ferry ride on a day the conference was in session. Their expenses for the rides ranged from $30 to $100. Some lawmakers also held fundraisers on the island during the conference. In 2016, there were three disclosed fundraisers during the conference. The most successful one was held on June 1 for Senate Majority Leader Arlan Meekhof’s Moving Michigan Forward II PAC. The event at Mackinac Island’s Yankee Rebel Tavern raised $17,200 total, according to a public disclosure. This year, Meekhof, Senate Majority Floor Leader Mike Kowall and the Senate Republican caucus are all holding fundraisers during the conference, according to the Senate Republican Campaign Committee. According to a policy on the Detroit Regional Chamber of Commerce website, fundraising or selling of ideas is banned from happening on the property of the conference’s headquarters, the Grand Hotel. “While much of the conference’s value comes from its networking capability, and while we do not intend to interfere with that benefit, the chamber has received many requests for such a policy from regular conference attendees,” the website says.